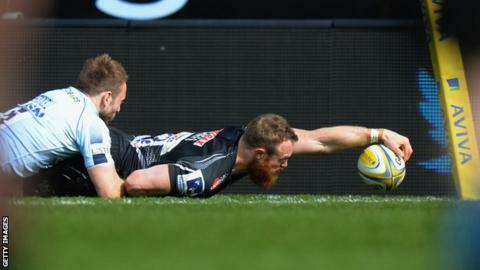 Exeter Chiefs secured a bonus-point win over Worcester Warriors to narrow the gap on Premiership leaders Saracens. Second-placed Exeter, who are now three points behind Sarries, were 17-0 ahead inside 25 minutes, with Thomas Waldrom, James Short and Olly Woodburn crossing. Tries from Cooper Vuna and Andy Symons then cut the deficit to five points. But Ollie Atkins sealed the bonus point after the break and Waldrom and Woodburn both completed hat-tricks to end Worcester's four-match winning run. Despite suffering their heaviest defeat of the season at Sandy Park, the Warriors' Premiership safety was still guaranteed following London Irish's home defeat by Sale Sharks. Dean Ryan's side had won just two of their opening 13 matches but four successive victories prior to Saturday's loss secures their place in the 2016-17 top flight, having earned promotion from the Championship last season. Exeter, meanwhile, need to win two of their remaining three games to secure a place in the play-offs for the first time, having missed out on the top four last year on points difference. "It was all about getting us back on track after a disappointing result last week. We had a review of our performance against Saracens and we weren't a million miles away. "We had to get our attack back in order and we looked dangerous for large parts of the game. "We were disappointed to give away a couple of soft tries just before the interval but we came out firing after half-time and it was important to get that try in the first minute of the second half." "We are running on empty and we showed we are not at their level. "We were never thinking we were a top-of-the-league side but it was a stark reminder for us. "They did a lot of damage to us in that opening quarter. It wasn't reflected on the scoreboard but their physicality and the pace that they played at made it very difficult for us, especially as we picked up yellow cards. "The depth of our squad wasn't up to the challenge and we need to keep improving. We need a week's rest as we don't want our season to drift away." Exeter Chiefs: Dollman; Nowell, Slade, Whitten, Woodburn; Steenson (capt), Chudley; Moon, Cowan-Dickie, Low, Atkins, Welch, Armand, Salvi, Waldrom. Replacements: Yeandle, Hepburn, Williams, Lees, Horstmann, Lewis, Campagnaro, Short. Worcester Warriors: Pennell; Heem, Olivier, Symons, Vuna; Heathcote, Hougaard; Rapava Ruskin, Annett, Johnston, O'Callaghan, Barry, Kirwan, Betty, Van Velze (capt). Replacements: Bregvadze, Leleimalefaga, Milasinovich, Sanderson, Cox, Baldwin, Lamb, Grove.